Does Bo Van Pelt Have the Best PGA Championship Apparel Script? 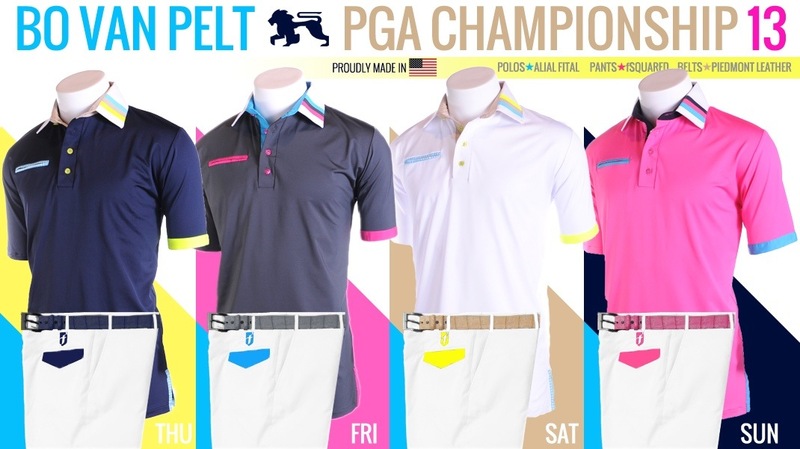 Several PGA Championship apparel scripts have already crossed our desk here at Golf Threads, and more are likely on their way. Bo Van Pelt’s script, however, is the early leader in the clubhouse. BVP’s major championship scripts have consistently caught our eye throughout 2013 and each one has been better than the previous one. Van Pelt’s looks for Oak Hill are pure class, and they are also unique in that three different brands have come together to outfit him (five different brands if you include his hat and shoes). In an era of head-to-toe apparel deals, it is refreshing to see a top-flight player mix and match pieces from multiple brands–and do it in style. Van Pelt is sponsored by Alial Fital, the boutique brand known for its distinctive dress polos with eye-catching patterned collars. Each of the polos in BVP’s PGA Championship script are solid colors and feature a contrasting hem, welt pocket and armband, along with a white stand up collar with matching stripes. While the polos are the focal points of Van Pelt’s ensembles, the pants from FSquared Clothing and belts from Piedmont Leather Company, play important roles in pulling the looks together. FSquared is a new brand making waves with its stylish, custom pants and shorts. The brand offers pants and shorts in a spectrum of colors along with the ability to customize the back pocket flaps with a patterned swatch. At the PGA Championship, BVP’s white pants from FSquared will feature a fabric swatch that matches the dominant color in his Alial Fital polos. FSquared pants are also worn by PGA Tour players Johnson Wagner and Brendon de Jonge. Colored belts are one of the hottest trends in golf these day. That being said, Van Pelt will certainly be on trend at Oak Hill with Piedmont Leather’s custom exotic belts, which coordinate with his polos. Piedmont Leather offers a variety of crocodile, alligator, snake, shark and stingray belts in modern styles and colors, and are a great way to add a little pop to your on-course look. Van Pelt will complete his look each day with shoes by FootJoy and a TaylorMade hat.